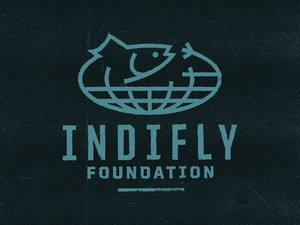 It wasn’t too long ago I was lamenting the fact there were no fish in the SF Bay Area to throw a fly at. That “fact” turned out to be pretty much wrong. See… there ARE fish to cast a fly at in the Bay (as some of you rightly pointed out). Stripers are my new trout. The SF Bay is becoming my new Upper Sacramento River. This is my new home water. I looked on the tide chart and then I came up with a bit of brilliance. I PUT IT ON THE CALENDAR. You know… the Google Calendar that runs my (and maybe your?) life. At the appointed time I found myself free to leave the house, with my fishing gear, and headed out to fish. I’m going to have to do that again. 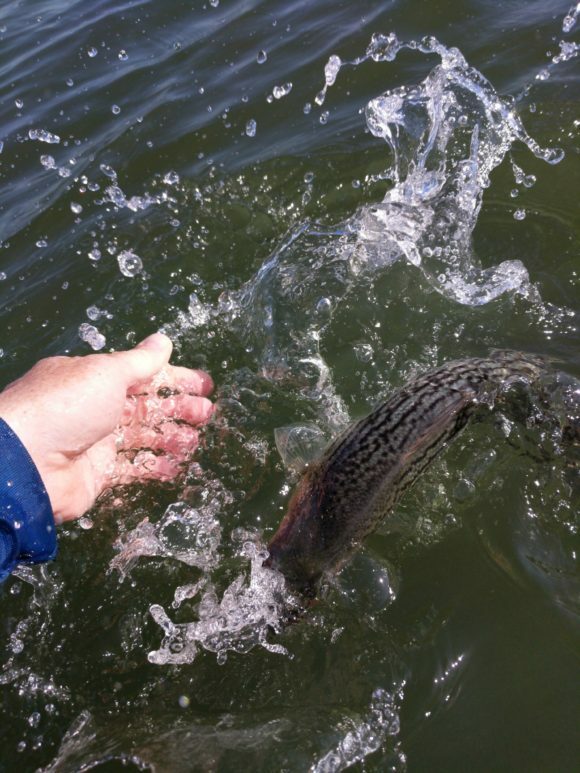 This Bay striper fishing is not full of crashing bait and running down.. well… stripers. You go out and you put in your casts, at the appropriate tide, and you see what happens. It is a little like swinging for steelhead (in this case, most like swinging for half-pounders). I’m loving having a bit of water that I’m getting to know… a bit of home water. It isn’t full of bonefish and tarpon, but it’s not empty either. There are times you are out there, going through the motions and you just can tell it isn’t happening. There is no encouragement. There are no signs things are going to pick up. It feels a little like maybe an academic exercise, but, ya know… you stay out there. Maybe an hour passes. Maybe more, and nothing is going on. So, you focus on your casting, on the mechanics of it all. When do you put the haul in? Where are your hands? What is the angle of the rod? Maybe let’s vary the strip a bit and see if we are picking up weeds. All of a sudden, the possibilities are endless and the water is probably full of fish. We are a funny lot. Both half full and half empty. 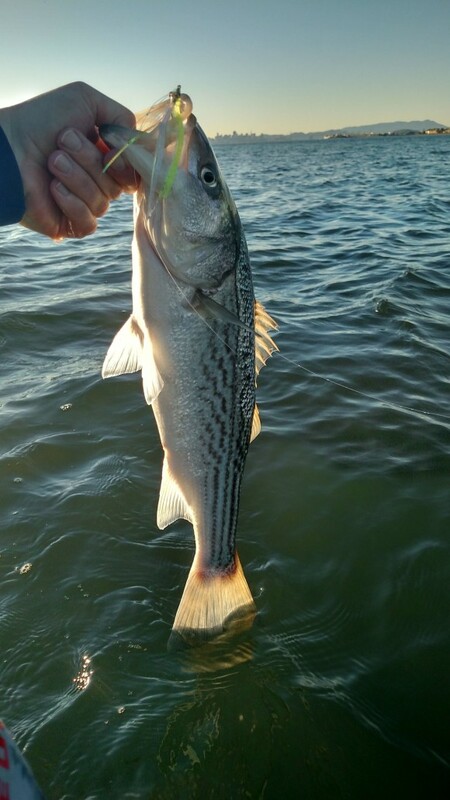 I went out for stripers again on Sunday, fishing pretty much the same tide as I did on Saturday. This is a game I am still trying to figure out. I have a hunch about ideal tides and a notion about what role the wind might play, but these are guessed at things. The fishing was slower. I caught less than half as many fish, not including a snagged ray that I thought was a monster striper for a few minutes. I don’t know why it was slower, although I do have half a guess. At one point, I had a gut feeling that the fishing was done and that there would be no more fish caught. I knew it, but had no reason for knowing. The water here is opaque. You can’t see the fish and they don’t give themselves away. It isn’t like bonefishing where you can damn well see the fish are gone and it isn’t like what I imagine striper fishing to be on the East Coast when you might actually see feeding fish. 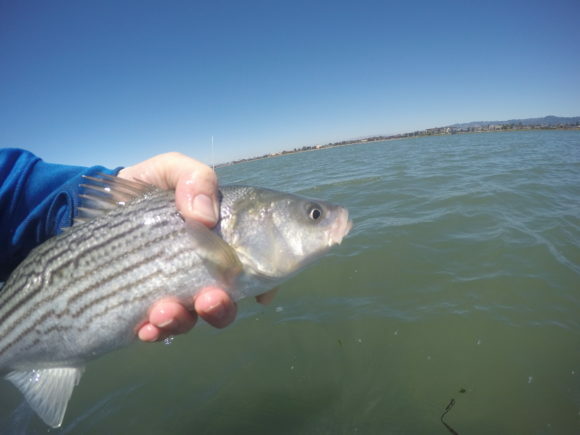 This SF Bay striper fishing for me at this point is just all gut feelings, limited personal history and vague ideas. I kept fishing though. I wanted to see if my gut feeling would be proven true. I wanted to test it a bit. I put another 100 casts in and had not one fish, not one grab. I fished it the same way I had fished it for the previous hour and a half with opposite results. I remember other days like that on other bits of water. I had one day on the Upper Sacramento when I had all day to fish, but 30 minutes on the water and I knew I wouldn’t catch a fish that day and I didn’t. This is water I normally do very, very well on, but there was a gut feeling I had that the fish weren’t going to eat. I don’t know how that sort of information gets transmitted or by what, but it does get received and understood by the angler. Sometimes the water talks to us and sometimes we understand. 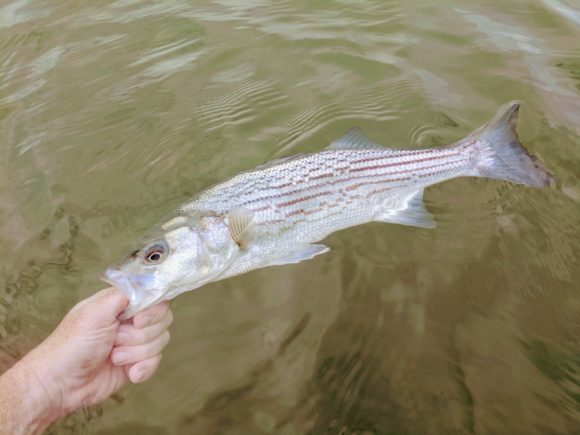 Until Saturday I had not caught a striper on a fly in 2016. I had caught a few with hardware, even one on a plug, but they just hadn’t turned on for the fly for me. Now, I’ve reestablished the striper connection and it felt fantastic. The water is a bit murky, so this is blind casting. There are no boils, no bait to follow, no birds crashing bait balls. This is just walking out there with a plan and a bit of faith and flinging a fly out there to see what happens. It would be just as easy to do this without a fly on and you could have the same results if the fish aren’t in, which is to say nothing. Saturday though… Saturday it worked. Casting out the clear int. sink with a lead eye synthetic clouser and just stripping it in when there was a big pull and a schoolie striper came to hand. That is just fun. It reminds me of fishing for steelhead half-pounders. There certainly are bigger fish out there, but a half-pounder pulls hard and there are more of them around than the big fish. That’s how this striper fishing is too. The fish aren’t huge, but the are fun and the pull harder than their size would dictate. 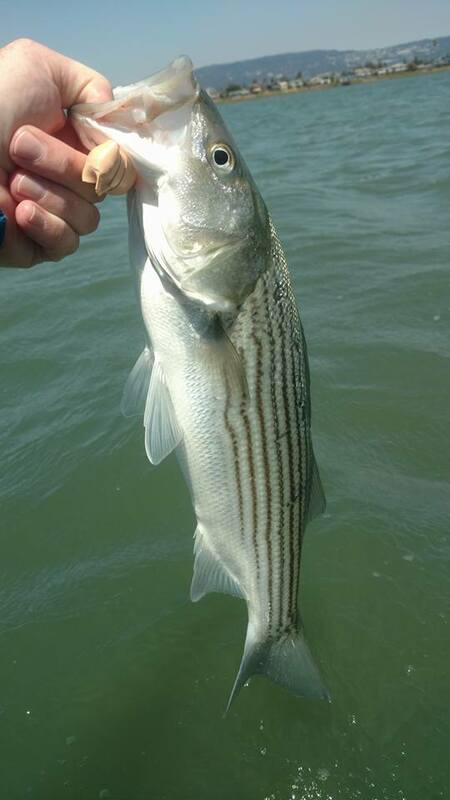 I fished for about 2.5 hours and managed just over a dozen schoolie stripers. This is about a 5 minute drive from my house. ALAMEDA, Many books about bonefish agree that the northernmost range of the bonefish extends up to San Francisco Bay. 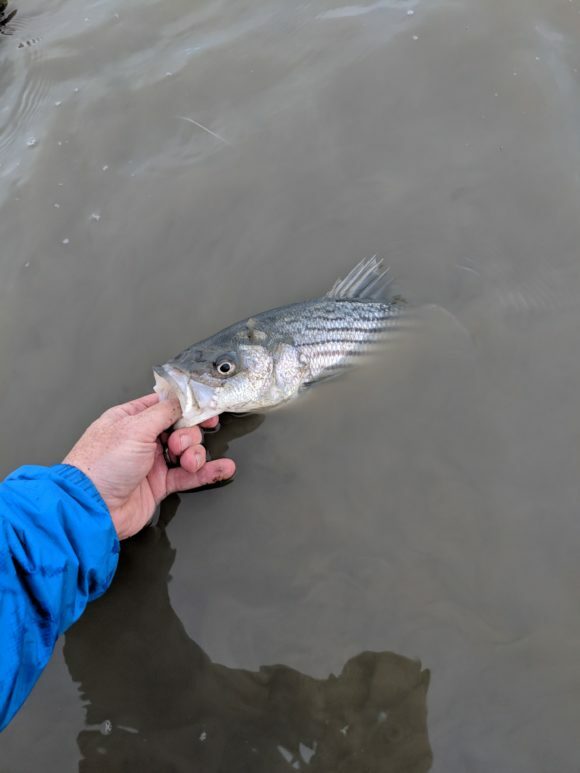 The last known catch of a bonefish happened back in the 1910’s, but with the arrival of global warming, the time seems ripe to bring bonefish back to the San Francisco Bay. 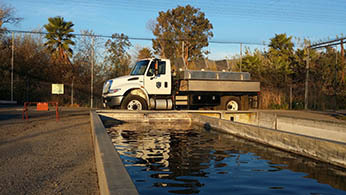 Building on the extremely successful Steelhead and Salmon hatchery programs, the State of California will bring industrial hatchery operations to the former naval ship yard on Alameda. 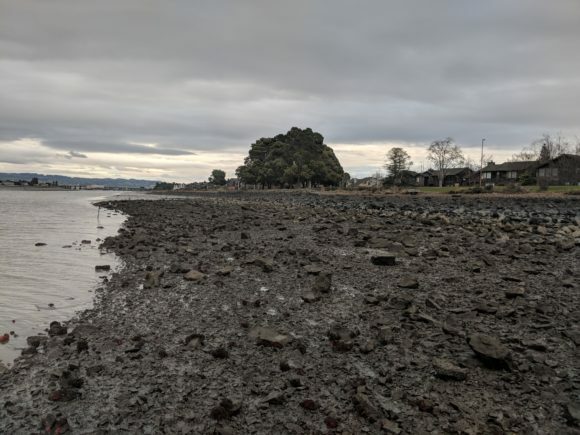 The hatchery will aim to release 300,000 juvenile bonefish into the Bay every year near the mud flats of Alameda and Sausalito. McBoatface added that the State expects 5 or 6 jobs to be created by this effort, which has an estimated price-tag of $300M. So, Grandpa went a bit over the top at Christmas and got my daughter a kayak for the Bay. This is nicer than my own kayak with a nicer paddle. This week, Spring Break for the girl, we finally got out on the water. Here are some things I’ve learned. Don’t head out on the last hour of the falling tide. Kind of tough to get back in the 5 or 6 inches of water. Yeah… that was tough. The girl is not so into paddling. She enjoys being out there, but not so much in, ya know, helping. The fish are not in. They aren’t supposed to be. But, ya know, I had to check. Kind of cool to be out there, on the water, getting to know the feel of this fishery/environment. That kayak is about, and this is an estimate, a million pounds. There is now a kayak trolley. We’ll see if that helps. I’m looking forward to seeing how this goes (and of getting a fish in that thing). I’ve had a revelation in fish form. 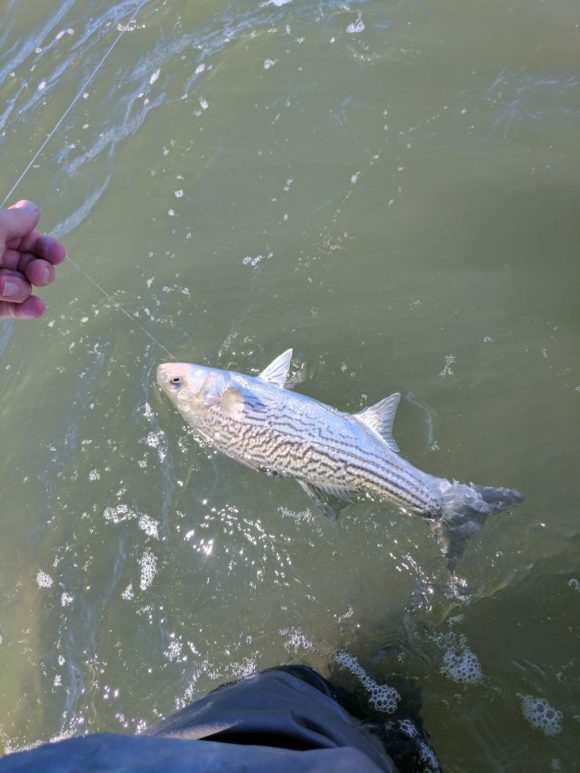 Stripers, fly caught, in my home town. 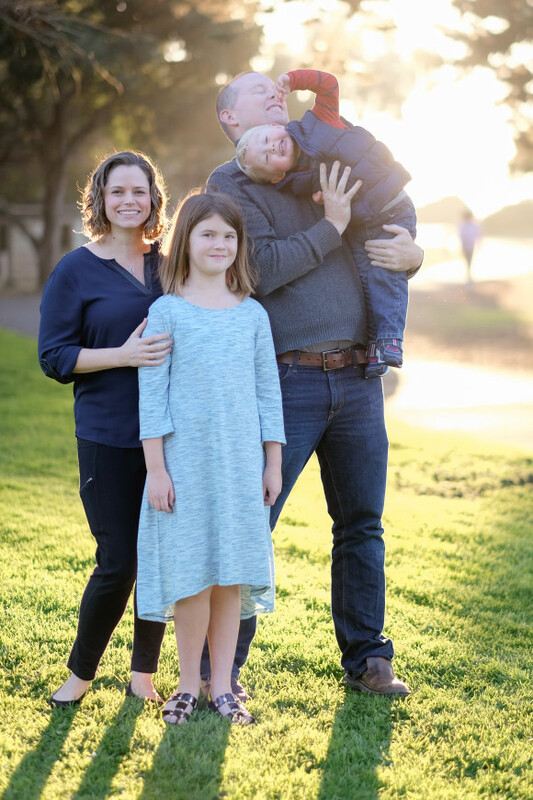 See… a couple weekends ago we were doing a family photo shoot at a local park. It went well, as you can see from the nice photo below. As we were leaving I saw a guy with a fly rod. I asked him what in the name of all that was holy and good he was fishing for. He said he was catching stripers right there. Like… right there. just a hundred feet or so away. He gave me the skinny and I thanked him. I’ve been thinking of that nearly non-stop ever since and today, when my wife got home a little early, she said she thought I should go fishing. Stripers. On the fly. Many of them. Without a boat. Minutes from home. And in an instant, my fly fishing life just changed. I realized my son may have his first fly caught fish be a striper, not a trout. How wild is that? As I was leaving that spot tonight I saw that same fisherman and I thanked him again for changing my whole perception of the Bay… for changing my life, in fact. I continue to be surprised by the SF Bay. Odds are if you live in the Bay Area, you don’t actually fish the Bay. You go other places to fish. You travel, often far, to throw at all manner of things. It never occurred to me that anything lived in the Bay when I first moved here. I figured it was a dead-zone, polluted and killed off long ago. And… that would be partly right. The commercial herring and anchovy fisheries collapsed long ago. There were toxic salt ponds in the south and the steady stream of heavy metals from the gold mining days. It just never seemed like much was living here. The Bay doesn’t really let you get to know it easily. 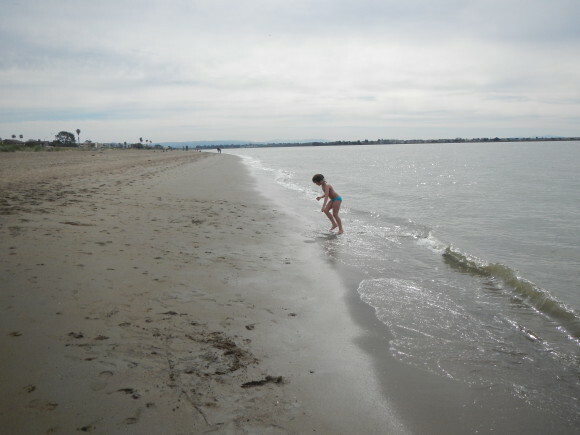 Since I found out there were, indeed, fish swimming in the Bay I’ve been soaking bait for sharks with my daughter. You never see the sharks. The water is generally not clear enough to see much of anything. There aren’t schools of bait-fish blowing up. There aren’t rays flying out of the water. Sure, there are the seals up around San Francisco, but I’m guessing they are there for the Blue Bottle coffee (although one did just get munched on by a Great White). This weekend I walked out to walk the flat in Alameda with a spinning rod and a Kastmaster. The water was flat and glassy, which is a bit rare. The Bay is a windy place and the water is usually whipped up. 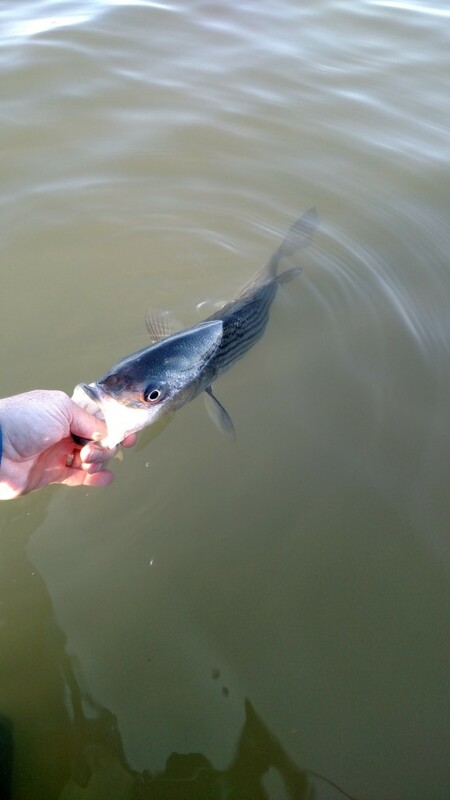 With the glassy water I could actually see schools of bait-fish moving about in two feet of water. There were a couple of smaller swirls, but nothing major. And then… there was a hit on the spinner and a small halibut was landed… and then a schoolie striper followed by another schoolie striper. These were on a spinner, but if I can find them with any consistency, a fly is going to be deployed in short order. There are stripers swimming around just a couple hundred feet away. I am starting to wonder what else I don’t know about the Bay.